Unless you've spent your life avoiding how to cook - you know who you are - you've probably cut up an onion and experienced the burning tears you get from the onion vapours. Why does this happen? Well, this is a natural response that the onion has evolved in order to protect itself from those humans and animals who are trying to eating. So how does an onion make you cry? When you prepare an onion by slicing into an onion with a sharp blade you inevitably cut through the tiny plant cells within it, splitting them open and releasing their contents. 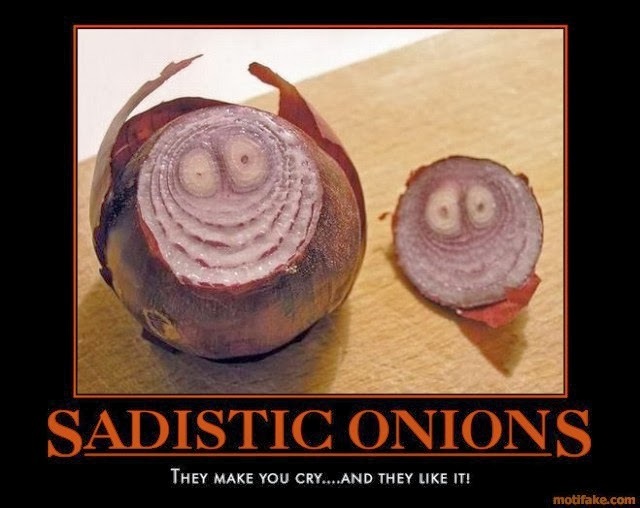 Unfortunately, when this happens amino acids within onions cells oxidise to form sulfenic acids. Other enzymes that were previously kept separate within the onion bulb are now are freely able to mix with naturally occurring sulfenic acids. These react to produce propanethial S-oxide, a volatile sulfur compound that takes the form of a gas. This gas reacts with the water in your tears to form sulfuric acid which as you can imagine will gently burn your eyeballs. The burning sensation stimulates your eyes to release tears to wash the irritant away. This makes your eyes feel better, but also makes you look as though you have been crying. You may have heard of the Scoville Scale Rating which is used to measure the 'hotness' of a pepper. Well, there is something similar for onions. Called the Pyruvate Scale, it measures the pungency in onions and garlic. To avoid the worst of having onion acid in your eyes, avoid cutting into the basal root of the onion. Alternatively refrigerate your onions prior to cutting, have a fan blowing the propanethial S-oxide away from your face, wear goggles or (if you can be bothered) try cutting your onions under water.